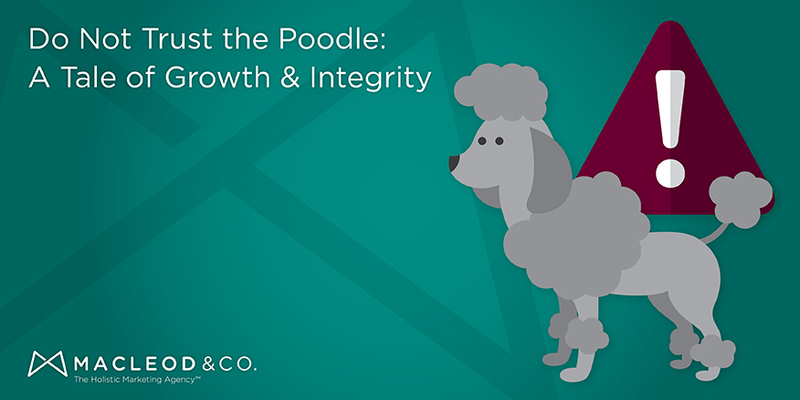 Don't Trust the Poodle: A Tale of Integrity | Macleod & Co. This excellent article about Blue Bottle coffee is, of course, about much more than Blue Bottle Coffee. Blue Bottle Coffee is the latest craze in specialty — sorry, artisan — coffees. It’s New Orleans-style coffee, which means it’s roasted with chickory, and served in an unassuming school-milk-carton type package. People are going bananas over it. In the article, the author digs into the question of how to keep the integrity of your product intact while going from a scrappy, passionate start-up to a massively successful operation with $25M in venture capital. How do you become Starbucks (wildly successful beyond your most fantastical dreams) without becoming Starbucks (a commodity, with a product that is by many measures, sub-par)? If only we were all so lucky to wrestle with such problems. How do you go from small business to national player and keep your brand integrity? Stop for a moment to appreciate that this is a devil poodle, because Mephistopheles is the devil (roughly). But for Freeman, this poodle is actually about a different varietal of evil. First of all, let me posit that the type of business owner that reads Goethe to know his employee better is well-equipped. It’s that type of thinking that makes him a successful business owner. But I digress. What’s really admirable here is Freeman’s suspicion of easy answers (in the guise of a poodle). “It’s hard to care,” he says. Caring, for Freeman, means tending to details and maintaining the highest level of quality even while orders, quantities and expectations explode. Caring is keeping your eye on the big picture — environmental impact, business ethics — while attending to the details of product production. As any business owner will tell you, that isn’t easy. Our favorite success stories begin with a single entrepreneur with inspired vision. It’s sad to see a brand built from that passion decay into a husk of itself. Maybe it’s deterioration of quality of the product itself, or maybe it’s just that somewhere along the way it lost its authenticity. In any case, your brand, and the brand experience you build along the way, require constant minding. Some business owners come to agencies looking for a silver bullet. If an agency ever claims in a pitch that it will be easy, then you best start checking under the conference table for poodles. Of course, as an agency, it’s our job to make it appear easy. And while we work hard to maintain your brand image and integrity, it will leave you the time and energy to do what you’re best at: preserving the integrity of your product and the purity of your vision. And the time and energy to resist the allure of the devil poodle.